Troxel Helmets Home Testimonials Thanks Troxel - You Saved My Life! Thanks Troxel - You Saved My Life! Last April I was schooling my 7 year old cob at home one evening. He is normally no trouble to school and I almost didn't put my hat on, but then I changed my mind because I always wear a hat so there was no good reason not to this time and I'm so glad I did because it saved my life! As we were trotting from E to B something happened and he started jumping about a bit and I came off and seemingly landed straight on my head! I was knocked unconscious briefly and was very lucky to be found by a neighbour who came and helped me up. All I could think about was getting back on my horse, so I did and I rode through the lanes for a few miles before heading home again. I had serious concussion, minor bleed on the brain, whiplash and probably a hairline fracture to my skull. My speech, concentration and memory was affected. I also had weakness down my left side due to nerve damage! It took weeks for me to recover and I still suffer from the whiplash and poor short term memory. My hat is cracked from top to bottom and is a bit dented. Had I not been wearing my hat I would have needed surgery at the very least. I now keep my hat as a souvenir and of course I ALWAYS wear a hat! 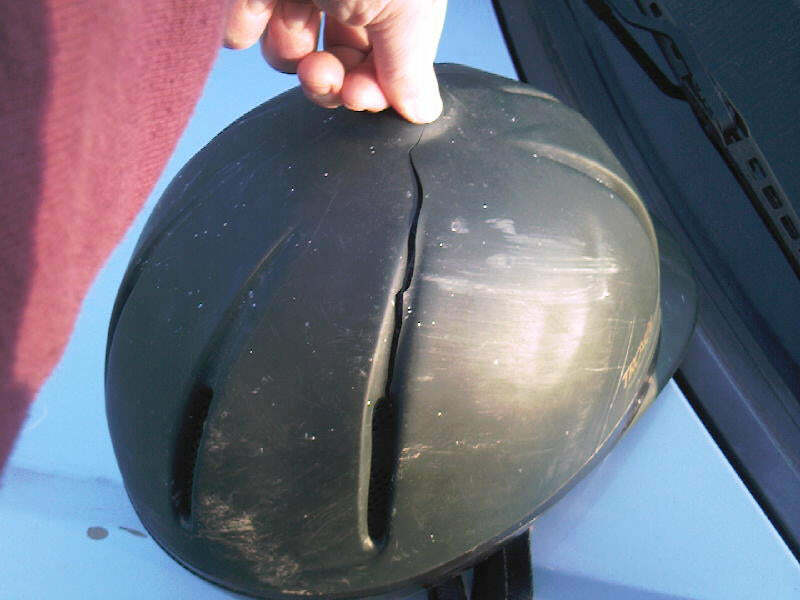 NOTE: Any Troxel helmet involved in an accident needs to be replaced immediately. In this instance, the rider got back on his/her horse after falling which is not recommended under any circumstances. Your helmet is only designed for one impact.